Watching Benedict and the Vikings beat up on the Packers Sunday, a comparison that hit me in the first meeting resurfaced. 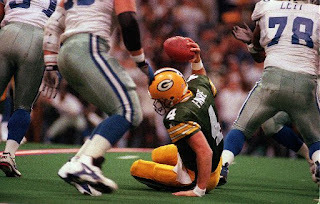 I was brought back to the early nineties, when the Packers were a young team on the rise and starting to make a name for themselves, and they were feeling pretty good until they ran into a juggernaut: the Dallas Cowboys. Their offensive line was impenetrable, their weapons were too much for the Packers defense to handle, and the offense seemed to be perpetually playing from behind. The Packers were haunted by a stud RB in Emmitt Smith, a Pro Bowl QB in Troy Aikman, and a multi-threat weapon in Deion Sanders. If you're now seeing shades of Peterson, Favre and Harvin, I've made my point. So what does this mean? Well, if we want to be optimists, we can draw the conclusion that this Packer team is around the 93-94 stage of the Holmgren era, and we have nowhere to look but up. Perhaps a wild-card is in the future this season, a division title next, and a Super Bowl in the 2011 season. And with psychos like Jared Allen on the squad, the Vikings are doomed for an implosion down the road, especially once #4 retires. But wait, the pessimist counters. That also likely means Favre is destined for a Super Bowl himself--a huge blow to the Packers organization. Nobody is touching him thanks to that beast of an o-line he struts behind, so while he may be old and fragile, he can still make all the plays as long as he doesn't get knocked around. As for the Packers, well, Holmgren never saw a losing season, and their team was never so undisciplined as this squad. The optimist's retort? Holmgren also didn't see the NFC Championship in his second season as coach. At any rate, Wolf took over in 91, brought in Holmgren in 92, and brought home the Lombardi trophy in 96. This year is the equivilant of the 95 season. I'm holding out on making judgement on the Thompson/McCarthy administration until 2011. Beyond that, Rodgers is a much more disciplined quarterback than Favre ever was. He keeps his head down the stretch of a game and doesn't throw the costly pick. Keeps his head?? the pessimist replies. The only thing he keeps is the ball. In his hands. For too long. Favre may have thrown some costly picks, but from 95-97 not only did he not throw many, he was MVP of the league, thanks in large part to his risk-taking ways. Rodgers never takes those risks. He takes sacks instead, and thats why he'll never elevate this Packer team to the elite level. Alright you two, I'm cutting you off there. The bottom line is the Packers are a young team, so there should be a bright future ahead. But Thompson needs to act this offseason in free agency, as the "youngest team in the NFL" moniker is starting to wear as thin as "boyish enthusiasm for the game" comments from sports broadcasters covering Brett Favre. 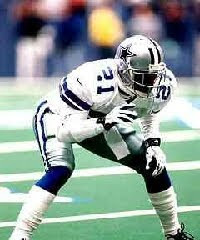 Woodson was his Reggie White, and Ryan Pickett was his Santana Dotson. If he's going to keep his job, he needs a Keith Jackson, an Andre Rison and maybe even a Eugene Robinson. Not necessarily game breakers, but veteran upgrades at key positions to put the team over the top. But the one thing that depresses me about all this? If the comparison holds true, we'll never see the Packers beat a Favre-led Viking team. Even if he does play next year.